University of Manitoba students have indicated they wish to continue membership with the Canadian Federation of Students. After voting closed Feb. 2, 3,877 votes has been cast, with 64.6 per cent in favour of continuing membership. 35.4 per cent were against and 8.8 per cent abstained. Online votes were tallied on umsu.simplyvoting.com and a polling station was set up in front of the student union office in the UMSU University Centre. “I’m very happy about the outcome,” he said. Established in 1981, the Canadian Federation of Students is the largest student advocacy association in Canada. With over 650,000 post-secondary students represented, the association spearheads student advocacy at the federal and provincial levels. 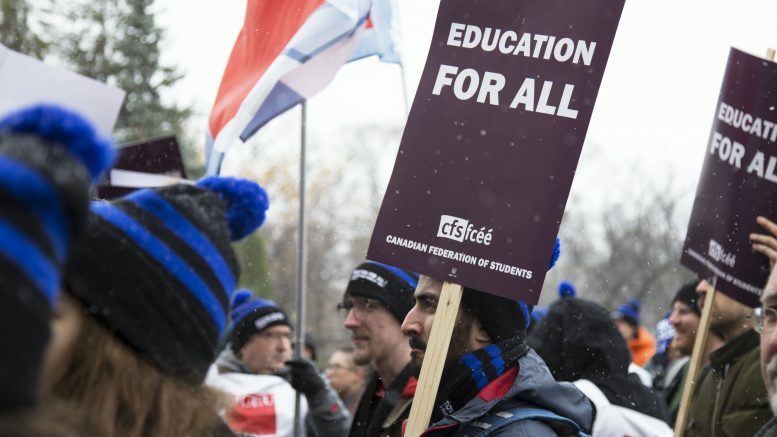 The federation has been lobbying country-wide to challenge tuition increases – including Manitoba’s Advanced Education Administration Act, which lifted the cap on tuition hikes and removed restrictions on course-related fees. The bill passed its final reading in November. Universities in Manitoba are now free to increase tuition by five per cent plus inflation annually, beginning in September. The plebiscite was first introduced as part of a council motion drafted by St. Paul’s College Student Association representative Arthur Coelho Reis on Nov. 9. “I will be following the will of my constituents and keep advocating on their best interest,” he said. The plebiscite has come in the wake of rocky tensions between the federation and the students’ union. During the 2013-14 academic year, the then-UMSU executive refused to transfer fees to the Canadian Federation of Students following a dispute regarding ownership of the UMSU domain name. This was settled on July 2016 after UMSU agreed to pay $993,562.18, a sum which included provincial and national fees. Most recently, on Dec. 2016, UMSU demanded an apology from the federation, claiming that its executive members verbally harassed Nagra at a national meeting. The harassment allegedly took place after UMSU brought forward a motion that would amend the federations’s policy on international students, calling for the national union to advocate for international student fee increases to be locked at the same percentage increase as domestic students. Canadian Federation of Students Aboriginal Students’ commissioner Annie Beach called the move to hold the plebiscite surprising. 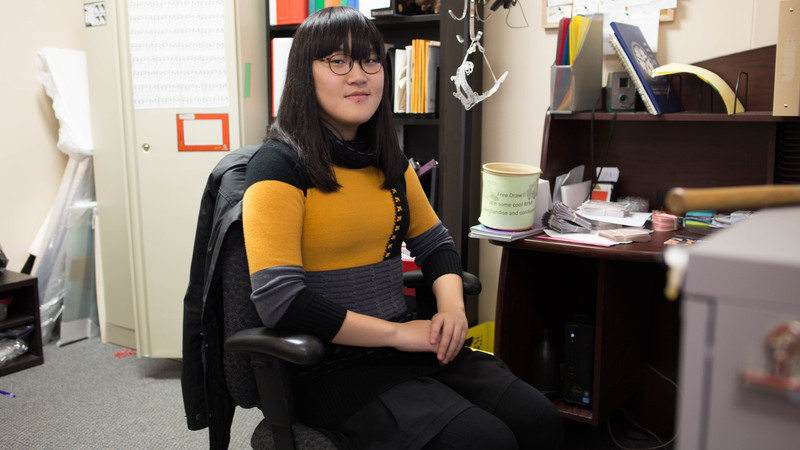 “It was interesting that UMSU was considering holding a plebiscite knowing that all of the hard work that the CFS does for students,” she said. Nagra said she is ready to leave her “personal concerns” with the federation in the past. “I’m here to serve students and if that’s what students want then this is what we have to do,” she said. “I also believe the result shows that University of Manitoba students are tired and have no interest in the recent plague of counter-productive, self-serving, and quite frankly petty motions presented by some UMSU councillors that have done nothing but delay any sort of unified student movement in the province and across the country,” Wilson added. At its regular council meeting, Feb. 1, UMSU approved a series of changes to its Governance and Operations Manual. UMSU’s governance committee presented a list of amendments at a previous meeting in January, which included changing the titles of the aboriginal student representative and the re-addition of the student senate caucus. The caucus provides an open forum for student senators to discuss the affairs of the U of M senate and to further complement advocacy and student representation efforts on campus. All amendments were grouped together in a single motion and approved unanimously by council members. Wilson noted the importance of the union being situated “at the leading edge of terminology” in terms of its respect for all cultures after the aboriginal representative position was re-named Indigenous students’ representative. “Aboriginal is not inclusive of the Métis, Inuits, and just general sense of Indigenous cultures and the strong sense of diversity we have in Canada,” he said. Correction: An earlier version of this story incorrectly stated that UMSU council passed a motion to introduce a mature student representative position to council. In fact, the motion was sent to the governance committee. The Manitoban regrets the error.